We've lived here for a couple of months and it really, truly feels like home, like this is where we are supposed to be. While our old home was on the market I drove past this house so many times, knowing it was out of our price range, but wanting it anyways. The first time I stepped foot into it I cried out, "I love it! I want to live here!" and my kids sped off, running down the hall and through the rooms. We all wanted this house. Looking back at the whole selling-a-house-buying-a-house, months and months long extravaganza, I can see the Hand of God holding some things back and moving other things right along, aligning everything so that we could get a great deal on this house and make it our home. It feels like us in this house was meant to be, most especially because the former owners were never able to have children. I have a very strong sense that Vera, who passed away last December and lived here as a widow for at least a decade, is so pleased that our family has filled her home with color, laughter, toys, bunk beds, love, and life. I think of Vera every day; I pray for eternal rest for her soul but I also suspect that she is already at peace and is praying for me and my vocation. Maybe all this sounds crazy, but I feel a connection with her and I think she loves my kids. In a way she's like my Ellie. So enough with the sentiment. Here's the first leg of the tour: outside. I love our front porch. The kids play out here and I like to sit and listen to my wind chime. When we bought it there were massive bushes that had taken over about 2 feet of the porch. 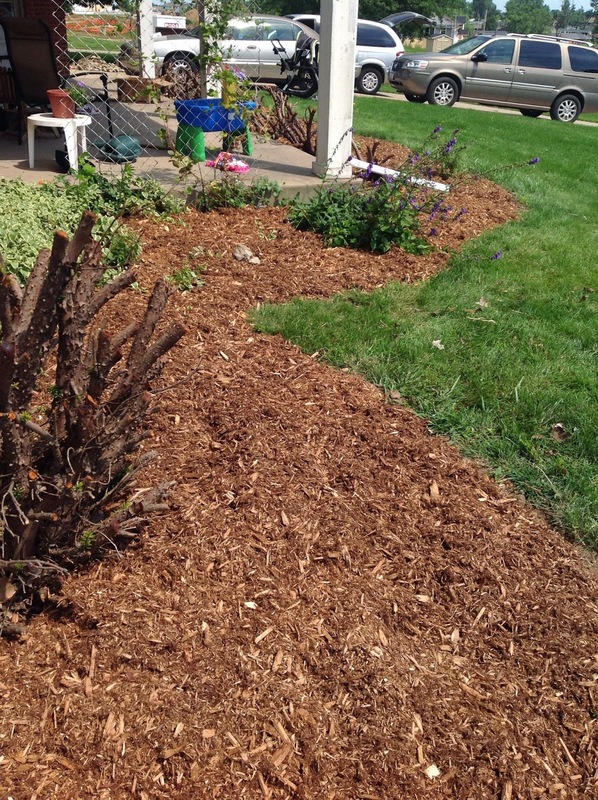 So we cut those out, put down some mulch and planted some flowers. Now that mums are finally available I need to buy some of those, too. Later in the fall I'll plant some bulbs and next spring I will gather some more flowers to fill in a bit more. Now a word about the tornado. 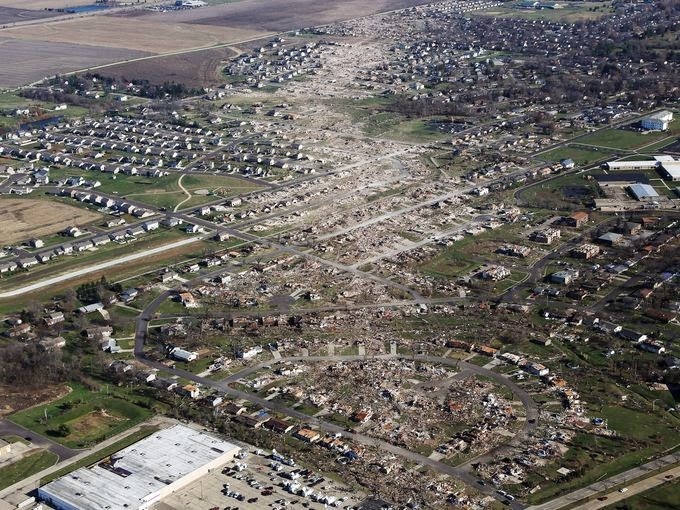 Last November an F4 tornado went through the town we now live in. Our home was right on the edge of the destruction. Our house, which is just below the thick, white stripe of a road on the left side of the picture, was fine. Some windows were ruined, damage to the downspouts and gutters, an uprooted tree, some shingle blown away, and lots of debris left in the yard. Most of our neighborhood was not so lucky. The homes across the street from us were half gone when the tornado moved past and had to be torn down. Construction workers' trucks have lined our street all summer and this has been our view. Can we say a quick prayer for the people affected by the tornado? So many people lost everything. Let me show you the backyard. When we bought the house, it had a small, busted up patio that ran right up to the house. The boxwood bushes had grown too big and there were other various dead things surrounding it. If there was one thing I learned at the last house it was how valuable a good patio is to our family. Therefore getting a new, big one was a very high priority for me. With the help of family and some for hire students I got my new patio, just in time for JP's first birthday party. That pile of rocks under the tree will one day be turned into a pondless waterfall at the edge of the patio. I think I'll put a beautiful Marian statue next to it, along with one of my favorite flowers: bleeding heart. In the meantime, that pile of rocks is home to a family of chipmunks whom we love to watch from our dining room window. Travis also cleaned out that shed in the back corner of the lot, rehung its broken door, piled up firewood from several felled trees, and began a compost pile. Also, I love the clothesline. I only dry the sheets and towels out there but that's enough. It's great. Now we'll head back to the front of the house for a little sneak peak of inside. We painted the front two rooms a light grey-blue. My beloved curtains from the old house's dining room now hang in the living room and the shoe bench sits as a sort of small divider between the not-so-grand-but-I-absolutely-love-it entryway and the rest of the living room. I keep a small silver dish on the half wall to drop in keys, coins, mail, and other miscellany. Next I'll show off the living and dining rooms! I love house tours so, so much. Also, your beautiful new house reminds me of a larger version of the home I lived in in Detroit. Memories. Can't wait to see the rest- you guys have been busy!! So excited you guys feel so at home there! Love the outside and looking forward to seeing more. It's crazy how God makes sure things fall into place, we feel the same way about our house! I second the house tour love! Do you remember, per chance, the name of the blue-grey paint color? Love this, Bonnie! What fun to get a little peek into your new home. So happy for you all! I love home tours! Show us everything! Yay for house tours! You've been busy to accomplish all this in such a short time! Such a beautiful home Bonnie! So happy for you guys. Your house is lovely!!! I love all the back yard! My parents and extended family and my husband's family all live in Pekin and I remember when my dad called about the tornadoes that hit that area. And then the winter that followed! Yes, still keep Washington in our prayers. There's still so much left to clean up and fix. I love it! You've done so much to beautify the outside and entryway, I can't wait to see the rest. And I just love your story about Vera. Congratulations on your home! Sorry this comment is a month late (catching up on blog reading). Love the pictures! Having bought a "fixer upper" ourselves, I can totally appreciate all the work you are putting into it. We need to redo our backyard too, I really really want to put a new patio in after we fill in the broken inground pool. We have family who live in East Peoria and know all about Washington, the area is so beautiful. Congrats on your new place! I can see why you love it! I think the patio looks great already, and I'm sure your improvements will only add more to it. I would love being right on the trail like that. Glad you're enjoying your new home!